The Port Phillip Bay Environmental Study was a $12 million project that ran over 4 years starting in 1992. The Study investigated Port Phillip Bay’s ecology, physical processes, and nutrient and toxicant levels. It identified the sources, concentrations and dispersal of pollutants in the Bay. Importantly, it identified the critical nutrient load which the Bay can tolerate. Port Phillip Bay is one of Australia’s most important bodies of water. It is the entrance to Australia’s busiest port, and has over 3.2 million people living around its shores. CSIRO designed and managed the Study, which involved over 40 research tasks, investigating the complex and numerous factors involved in managing the Bay. Water quality was linked to inputs from land activities, such as nutrients from sewage and industrial plants, run-off from agricultural land, and surface run offs from cities. These inputs are then mixed or blown into the ocean, or may settle in bottom sediments. Understanding the interactions between these processes is crucial to managing the Bay. The project saw CSIRO scientists undertake original research and push the boundaries of environmental modelling, to provide decision makers with unprecedented predictive power over the impact of future development around the Bay. The Study team was awarded the CSIRO Chairman’s Medal in 1997. In the early 1990s, there were community concerns for the health of Port Phillip Bay, the entrance to Australia’s busiest port, and which has over 3.2 million people living around its shores. The main concern was that, with the amount of human activity in and around the Bay, how could authorities maintain water quality and the health of the Bay’s ecosystem, especially in relation to nutrients and toxicants entering the Bay from wastes and other unsustainable practices. 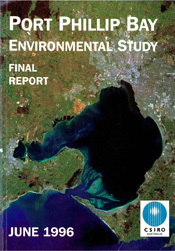 In 1991, the then Melbourne and Metropolitan Board of Works (MMBW) approached CSIRO’s Environmental Projects Office, for advice on the sustainable management of the Bay. Dr Chris Crossland, the then Director of the Projects Office, assembled a team of technical experts from within CSIRO, and over a period of several months, together with representatives of Victorian Government Agencies, they consulted widely with stakeholders to identify all of the issues of concern. They were also asked to formulate a study design that would determine the environmental status of the Bay in relation to nutrients and toxicants and provide the basis for long term management of point and diffuse loads. The initial CSIRO study design team comprised Chris Crossland (Director), Graham Skyring (Nutrients), Graeme Batley (Toxicants), John Hunter (Physics/hydrodynamics), Trevor Ward (Ecology) and Peter Jernakoff (Ecology), together with Tony Chiffings (Melbourne Water) Colin Gibbs (EPA) and Gus Fabris (Department of Conservation and Environment). The design for the Port Phillip Bay Environmental Study (PPBES) was accepted by the stakeholders with an agreed budget of A$12 million for a 4-year work program to be funded by the newly privatised Melbourne Water Corporation. A study office of four staff was set up in the Melbourne Water Building in Melbourne to undertake the day-to-day management of the project. The small team headed by Brian Newell (ex-CSIRO Oceanography) was joined by Doug Hall as Operations Manager, Colin Arrowsmith (later Robert Molloy) as Database Manager and May Ong as the administration officer. The Study itself involved 47 individual scientific tasks ranging from physical oceanography to fisheries biology. Each required a work program and had to go out to tender. Ultimately a team of 30 contractors were involved in undertaking the program, made up of three Commonwealth (federal) agencies, six State agencies, nine tertiary institutions and twelve private consulting firms. CSIRO itself had nine tasks (those of synthesis and modelling being the most important) and was responsible for the science management policy interface. Dr Graham Harris took over from Chris Crossland as Study Director and Director of the Environmental Projects Office in 1993 and saw the project through to its completion on time and under budget. Graham, was assisted in the synthesis of study task outputs by the project technical group, which comprised members of the initial CSIRO study design team (Graham Skyring, Graeme Batley, John Hunter, and Peter Jernakoff) and John Parslow (Integrated modelling). Later, Stephen Walker (who replaced John Hunter), Alexander Murray (Modelling) and David Fox (Statistical Analysis) joined the group. The PPBES has been described as the largest and most integrated piece of coastal marine research ever carried out in Australia, and a unique example of multidisciplinary scientific study, but it is also a model for future management and understanding of large catchments in Australia and overseas. Managing such a huge project was a fairly unique experience for a CSIRO team, normally focused with delivering science. The team also had to contend with some concerns from commercial environmental consultants about a public sector agency moving into their market and undercutting them. The team learned all facets of commercial dealings, from defining tender briefs, letting contracts, legal agreements, and even dispute resolution on legal agreements. The management structure involved a core group of CSIRO scientists, the Technical Group, whose numbers were expanded from the original team as new expertise was needed. The team was truly multidisciplinary spanning expertise as diverse as physical oceanography and through to marine biology, microbial ecology, environmental chemistry and ecotoxicology, drawn from five different CSIRO Divisions. They were overseen by a Scientific Advisory Committee, led by Professor Nancy Millis from Melbourne University who was a board member Melbourne Water. The Study reported to a Management Committee comprising representatives of the lead agencies, Melbourne Water, Melbourne Parks and Waterways, the Environment Protection Authority, the Department of Conservation and Natural Resources, and the Port of Melbourne Authority. Day to day interactions with the clients and the consultants was managed by the Study Office. The Technical Group met every 6-8 weeks over the four-year period, each time for three days, with findings reported by the Study Director to quarterly meetings of the Management Committee. Water quality was linked to inputs from land activities, such as nutrients from sewage and industrial plants, run-off from agricultural land, and surface run offs from cities. These inputs are then mixed or blown into the ocean, or may settle in bottom sediments. Understanding the interactions between these processes is crucial to managing the Bay. During the project CSIRO scientists undertook original research and pushed the boundaries of environmental modelling, to give decision makers unprecedented predictive power over the impact of future development around the Bay. Approached from a strategic scientific perspective, the Study promised to deliver what no commercial consultant could ‘ a prediction of what was the critical nutrient load of the Bay, beyond which the Bay’s ecosystem would collapse. It was a calculated risk. To arrive at such a prediction, it was necessary to develop and couple an ecosystem model to a physical model of the Bay. There were available models of the Bay’s physical characteristics, including tides and winds, but developing a model of the ecosystem was the real challenge. A series of 47 technical reports were produced by the Study. Fifteen scientific papers distilled from these were published in a special issue of Marine and Freshwater Research dedicated to the PPBES. A final report (Harris et al., 1996) was published at the completion of the project. The Study produced world class scientific outcomes that revolutionised our understanding of the functioning of the Bay. It delivered an ecosystem model now considered one of the world’s best. The information from the Study has been placed in a permanent database to assist authorities responsible for managing the Bay. Its findings and recommendations have already been incorporated into Victorian environmental protection policies, while the computer models developed by the project are helping Melbourne Water plan for infrastructure developments. The models helped predict the impact of changes on the Bay’s ecology, such as the effects of an increase or decrease in the amount of sewage present. Action has since been taken to reduce nutrient loads (principally nitrogen) to the Bay as recommended. The Study team was awarded the 1996 CSIRO Chairman’s Medal for the successful completion of what was the largest single interdisciplinary coastal marine study ever undertaken in Australia. The recipients were: Dr Graham Harris, Dr Graeme Batley, Dr Chris Crossland, Dr David Fox, Mr Douglas Hall, Dr Peter Jernakoff, Mr Robert Molloy, Dr Alexander Murray, Mr Brian Newell, Dr John Parslow, Dr Graham Skyring, Dr Stephen Walker and Dr Trevor Ward.